10/01/2016 09/28/2016 LetsPlayNintendoITA3 Comments on Corporate Kickbacks: Rebate offers added to the store! Corporate Kickbacks: Rebate offers added to the store! 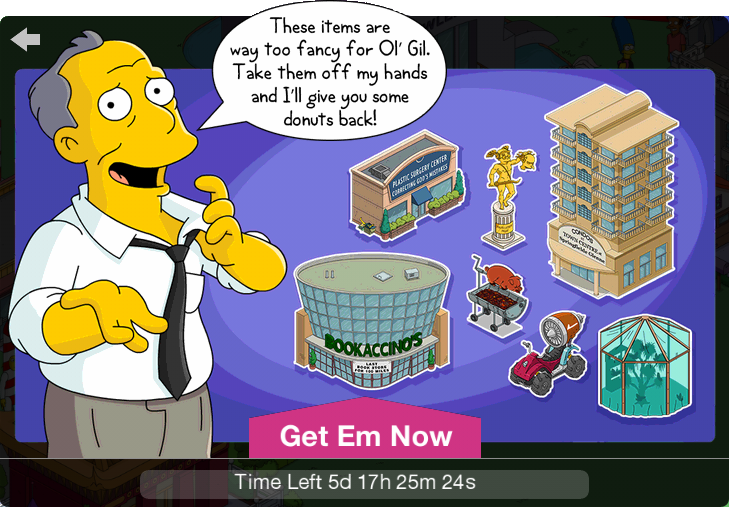 The second bunch of Rebate Offers for old and new items have been added to the store: Bookaccino’s, Hot Tub, Swanky Fish, Springfield Farmers Market, Jet Engine Bike, BBQ Pig, Plastic Surgery Centre and Cool Brown House w/Cool Homer! Is the Cool Brown House w/Cool Homer a good deal with the rebate? Basically 70 donuts for a building + character. Does he has tasks or is a NPC? Oh you’re right, it’s a skin! Guess I’ll save my donuts for the Black Friday specials.